The Tour de Fleece continues! Yesterday I spent an hour and a half spinning. I think I managed to spin up half of the 4 oz worth of BFL I’m working with, which filled up my bobbin. 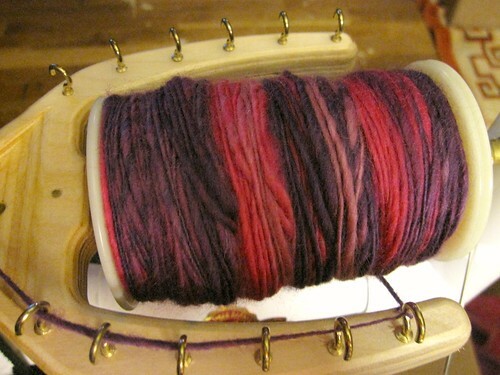 Pink and purple filled bobbin. By the time I was done, my knee was actually hurting a bit. I think that was probably the first time I spun for over an hour straight! I didn’t really want to stop, but considering it was 10 pm and my bobbin was full, I set it aside for the night. So far I’ve logged 13 hours and 55 minutes worth of spinning which averages out to over an hour per day. Last week I didn’t get in the hour per day I wanted to because I was feeling rather worn out from the week and even had a day that I didn’t spin at all. I was curious about my time and since I’ve been posting it in the Tour de Fleece group on Ravelry each day, I looked it up. Figured I’d share it here, too. A lot of days I did over an hour of spinning, but there are quite a few where I did less. Ah well, it’s been a lot of fun regardless! The best part has been seeing all my progress, getting more comfortable with spinning, and learning things as I go. Before the Tour de Fleece, I didn’t even know how to ply yarn! I got out my spinning book (Start Spinning by Maggie Casey, which came highly recommended by a number of people) and figured it out. Took a bit to get used to, but I think I did pretty good for my first try. Now I’m dreaming of all the things I want to get for my wheel, tools that would be useful, and fiber I want to spin! I got in some knitting time yesterday, too. 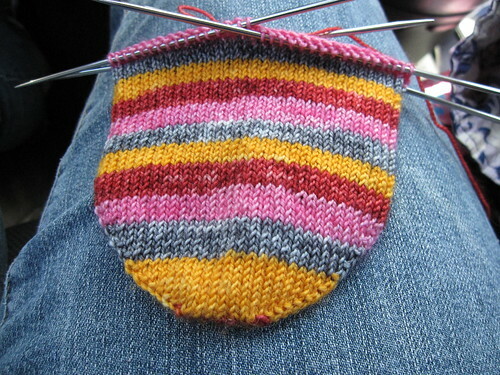 I’ve been working on the stripey sock during lunch this week and I’m getting close to where it’s time to start the heel. The cooking class last night was pretty good. My only real disappointment was that I was pretty sure my chicken wasn’t cooked yet (it was really thick in one spot), but the instructor thought it was and told me to take it off. Sure enough, in that one part it wasn’t cooked all the way through. As someone who’s been through culinary school, I’d like to think that I know what I’m doing when it comes to cooking something. I should have trusted my gut that told me it wasn’t done yet. Half of it was edible and I wasn’t hungry enough to eat the whole thing anyhow. The class was called “For the Love of Garlic” and we had a shrimp salad with vinaigrette, stuffed chicken breast, and risotto with snap peas and asparagus. Of course all of those had garlic in them! I usually don’t care for shrimp, but it was really good and I liked the vinaigrette a lot. I just realized we totally forgot our recipes at the place, though 😦 Bummer. I’ll have to call and see if I can get another copy. Go you on the spinning!! I’ve been such a slacker this year. Love that sock! Great colors! What lovely colors you are spinning. Very pretty. I also love the stripey goodness. 🙂 Good going! Oh yeah… You’ve definitely got the spinning bug! Looking good!! !